This is another of the games obtained by Dr. Haddon in Torres Straits. In Murray Island it is known as Geigi = King Fish, and in Mabuiag as Dangal = the Dugong, or Sea-cow (Rivers and Haddon, p. 151, Fig. 7). Second: Release the loop from the right index. 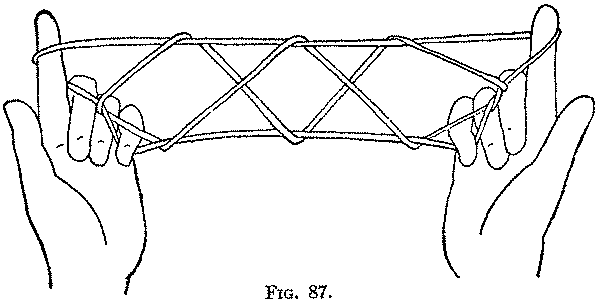 Separate the hands and draw the strings tight (Fig. 78). Third: Bend the left index down between the two index strings and hold firmly in the bend of the finger, the string which passes across the left palm and over the index strings (Fig. 79). 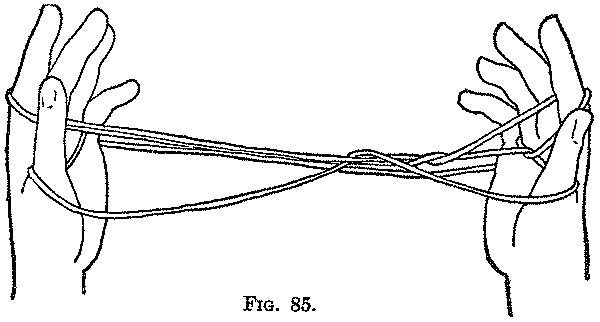 Turn the left hand with the palm down and the fingers pointing to the right, and let all the strings slip off the left hand except the loop held in the bend of the left index by which the strings can now be pulled tight (Fig. 80). Fourth: Arrange the loop held by the left index on the left hand in the First Position across the palm and behind the thumb and little finger. Fifth: Bring the palms together, point the left index downward, and put it, from above, behind the string crossing the right palm; with the left index still pointing downward pull the string away from the palm (Fig. 81), and, while turning the left index first toward you and then upward (Fig. 82), separate the hands. This movement puts a twisted loop on the left index. Sixth: Bend the right index down into the right thumb loop (Fig. 83), and then, turning the palm away from you, put the right index, carrying the right far thumb string, down into the little finger loop (Fig. 84) and pick up with its tip the right near little finger string (Fig. 85). As you return the index to its original position, of course, the string which was the right far thumb string slips off the index finger. This movement, which appears so complicated, is nothing more than the index finger pulling the near little finger string through the thumb loop. 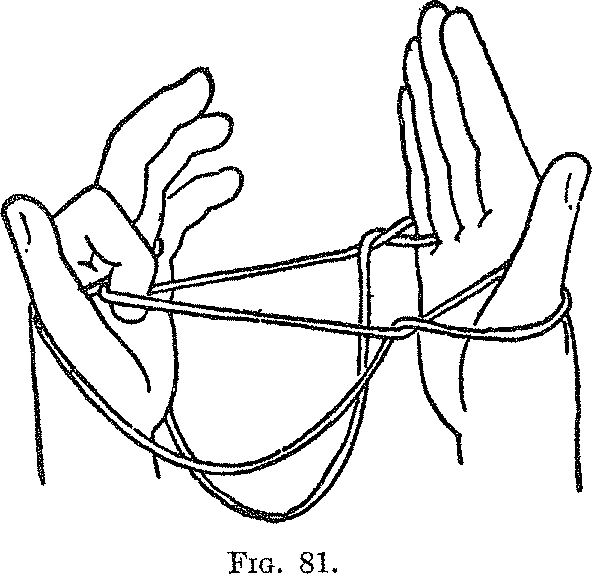 You now have on the left hand a string across the palm and a twisted loop on the index; and on the right hand a near thumb string and a far little finger string; the near little finger string is looped around the tip of the index after passing under the far thumb string and pulling it over to the centre of the palm. Seventh: Bend the left little finger down into the left index loop (Fig. 86, Left hand) close to the index, and pull down and hold securely the left far index string. Eighth: Bend down the right little finger over the right far thumb string (Fig. 86, Right hand) where it forms the lower string of a triangle, whereof the other two sides are formed by the original near little finger string held up by the tip of the right index. Pull down this far thumb string in the bend of the right little finger. 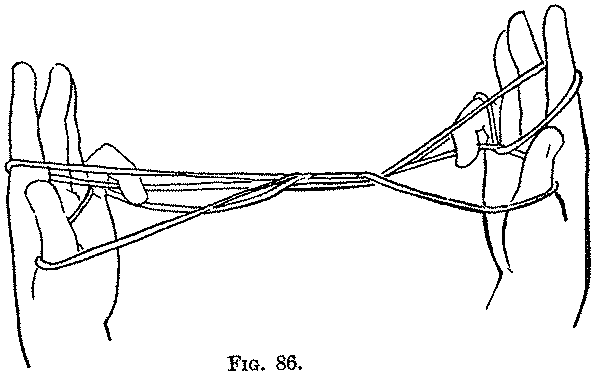 Ninth: Let the loops slip off the thumbs and extend the figure between the index and little finger of each hand (Fig. 87). The strings on the index fingers it must be kept well up toward the tips; if the figure does not come properly it can be worked into shape, by pushing toward the centre of the figure with the thumb the straight string running, on each hand, from the index to the little finger. 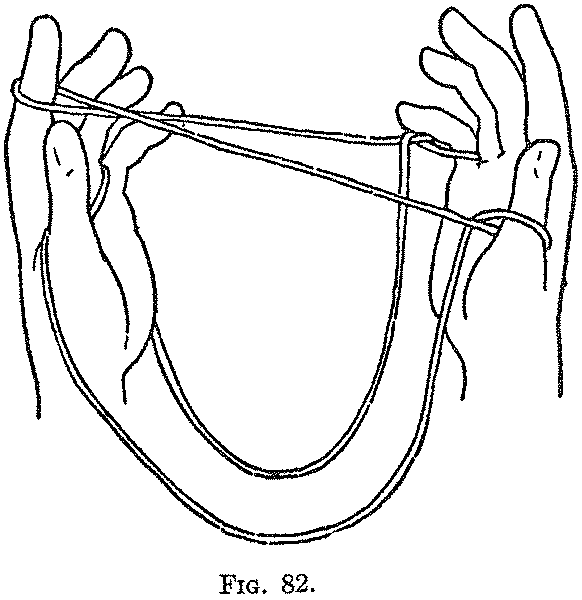 Tenth: If a second person put his hand through the middle diamond of the figure his wrist will be caught in a double loop when the strings are dropped from the left hand and pulled tight with the right; his wrist will not be caught if the strings be dropped from the right hand and pulled with the left hand toward the left. This is an interesting example of a figure which starts unsymmetrically, and then, after a series of very different movements by each hand comes out almost perfectly symmetrical at the end. You will notice that there is a twist at the right end of the right lozenge and a simple loop at the left end of the left lozenge. If the right palmar string be taken up first in the formation of Opening A, and then the movements of the hands reversed, the wrist will be caught in a double loop when the right-hand strings are dropped. By forming the figure first one way and then the other you can add to the perplexity of the observer.